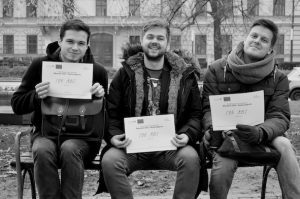 The Abs band was founded at Janáček Academy of Performing Arts on 18th October 2016 at 9:36AM through their first public performance together for the Academy’s jazz interpretation class. Their repertoire consists of original compositions as well as well-known pop and rock tunes with the intention of playing only original music in the future. Their main influences (besides fit and sweaty bodies) are country music, Delta blues, avant-garde music of the 2nd half of the 20th century and African music.